This high QUALITY official manual for 1984-1991 Ferrari Testarossa is 100 percents COMPLETE and INTACT, no MISSING, CORRUPT pages, sections to freak you out! This manual is exactly as described. It is in the cross-platform PDF document format so that it works like a charm on all kinds of devices. 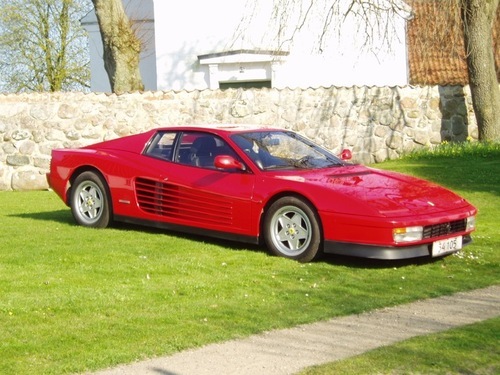 This highly detailed workshop service repair manual for download contains virtually everything you will ever need to repair, maintain, rebuild, refurbish or restore Your 1984-1991 Ferrari Testarossa (ALL MODELS ARE COVERED). All diagnostic and repair procedures and gives you access to the same information that professional technicians and mechanics have. You can view and print out the complete repair procedures with this workshop service repair manual Download - you do not need to be skilled with a computer. The pistons have the hole for the gudgeon pin which is off-centre by 0.8 mm with respect to the piston axis; for this reason an arrow 1 (fig. 18) is marked on the piston crown, it indicates the engine rotation. It is good practice to restore this reference point before disassembling the pistons for overhaul operations. The gudgeon pins are to be slightly forced into the pistons. When installing, make sure that the two side retaining rings are correctly positioned in the piston grooves. - The number marked on the big end of the connecting rod 2 (fig. 1 8) must be positioned toward the exhaust side (fig. 19). The arrow on pistons of the RH cylinder block will point away from the number. - The arrow on pistons of the LH cylinder block will point towards the number. towards the intake and those on pistons 7 to 12 towards the exhaust. Before fitting the piston rings, insert them in tool ALZF 8202, making sure they are at right angles to the tool's inner surface, and check the end clearance is within the values indicated in fig. 16. - To facilitate the assembling of the rings on the pistons, use a suitable tool. The 1st ring should have the inner beveling uppermost. Take special care that the oil scraper ring spring joint does not correspond to the ring slit. - With the tap closed, clean and bleed the injector with several rapid movements of the lever. Open the tap and test the opening pressure by moving the lever slowly (approx. 2 seconds per stroke). If the opening pressure is out of tolerance, replace the injector. Individual valves can also be replaced within a set. Leakage test Open the tap and allow the pressure to slowly increase up to 0.5 bar below the opening pressure previously determined, and hold it constant at that level. No liquid must leak from the injector in the next 15 seconds. N.B. : When loosening or tightening the lines to the injectors, always hold the fixed nut with the proper wrench.